Cambridge, Maryland — Twenty-three aspiring hunters gathered to learn how to pursue big game and provide food for themselves and their families at the Blackwater National Wildlife Refuge Oct. 26-27 during the refuge's inaugural First Shots deer hunt. The hunt was sponsored by the Union Sportsmen’s Alliance (USA), Maryland Department of Natural Resources and National Wild Turkey Federation. More than 60 applications were received for the 23 available opportunities to be mentored by an experienced hunter and learn hunting basics including scouting, stand placement, biology and field care. The individuals selected were all new adult hunters who did not have a support network to help them develop a new lifelong passion. Applicants were also eager to harvest their first deer, and at press time the apprentice hunters had harvested a total of 17 deer, with additional hunting opportunities set for later in the week. In September of 2017, the USA partnered with the Blackwater National Wildlife Refuge to conduct a sika and white-tailed deer population survey using infrared imaging technology. The long-term goal was to provide necessary population data to the refuge—allowing for more opportunities for sustainable deer hunting. USA put out a call to local members asking them to consider volunteering as a mentor. International Association of Heat and Frost Insulators and Allied Workers Local 24 Training Coordinator Brian Cavey wasted no time applying to be a mentor. Cavey, of Pasadena, Maryland, is a third generation insulator—having followed in the footsteps of his retired father and grandfather. His father was also responsible for introducing him to hunting and the shooting sports—which became a lifelong bond they shared. 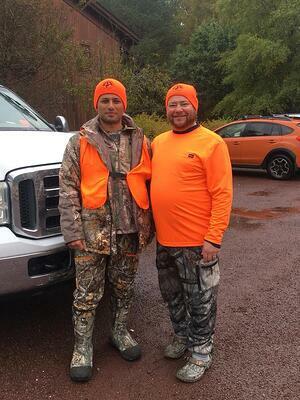 Cavey’s mentee, Nasr Majid, of Ellicott City, Maryland, explained that no one in his immediate family hunted—therefore he had no one to learn from but was still determined to pursue the sport. When he saw the ad for the mentored deer hunt on the Maryland DNR’s website, he was hopeful for a learning opportunity and applied. 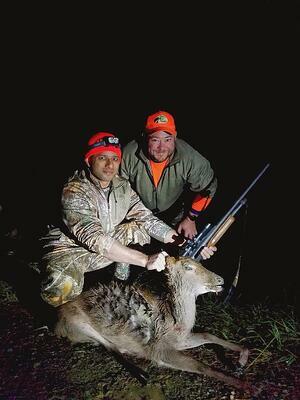 Cavey and Majid were all smiles after their deer hunt—having successfully harvested a hind (female sika) on the last day of the hunt. Chesapeake Marshlands National Wildlife Refuge Complex Project Leader Marcia Pradines highlighted the importance of partnering on these mentoring programs. The USA donated $3,700 worth of Millennium Treestands for the mentored hunt—one for every hunter. Other top brands and USA partners including Carhartt, Buck Knives, Plano Synergy, Outtech and Burris also donated a variety of products for mentors and mentees to enjoy.